The Jackson AJ-66 single tank low temperature conveyor dishmachine can clean up to 234 racks per hour! With 25" of clearance, it is able to accommodate oversize sheet pans, mixing bowls, and other large kitchen items. 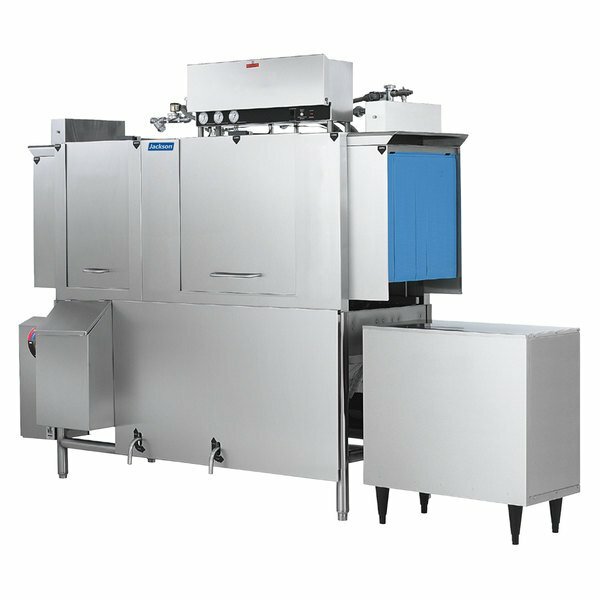 The Jackson AJ-66 conveyor dish machine features completely self-draining pre-wash, wash, and recirculating rinse pumps, and externally operated lever drains. Its exclusive "Energy Guard" system operates the machine only when a rack is being washed or rinsed, saving water and energy. The Adjust-A-Peak system allows the user to adjust the conveyor speed to quicken wash time for light washes, or slow wash time down for heavily-soiled loads.